This January I am doing a personal project – a photo a day, celebrating our everyday moments and creating special images of our family life to enjoy for years to come. I want to push my self and create wonderful images that I just love and then each day I will share here on my blog. I hope you enjoy and I would love for you to join me in documenting your children’s lives. This is my gorgeous daughter Elizabeth. For the past 12 months, horses have been her world. She loves everything about them and just seeing a horse as we go by brightens her day and brings her so much joy. 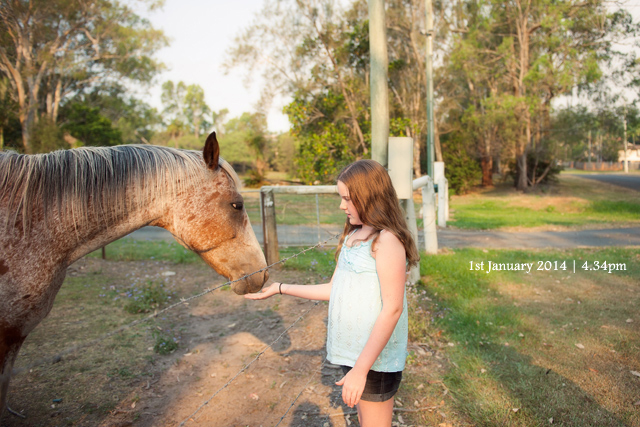 We are luck that at the bottom of our street there is a paddock with 2 horses in it, who she loves to go and visit. I think the horses love it too as they come over to us as soon as we arrive. Today as it started to cool down a little, I decided it was time to get out and go for a walk so we ventured down to see our friends the Horses. While we were there, this occurred. A quite moment between horse and girl. I just adore this image of the wonderful connection between the two of them. I am so grateful to have found for her, her happy place.